Did you know nearly 25% of business owners who faced a major power outage NEVER reopen their doors? The damage is a crushing *blow* to the bottom-line of any commercial enterprise since 1/4th are unable to recover from unforeseen power outages. For this reason alone, EVERY business stands to benefit from renting our commercial generating units. Although convenient to wait ‘until’ disaster strikes, every other business in your area will be ‘fighting’ to get their hands on a unit themselves. It’s a dangerous game of Cat n’ Mouse where the business ‘quickest to pick up the phone’ is the business that will be spared from facing considerable damage due to lack of power in the surrounding area. Plus, there’s little guarantee we’ll have available units in the midst of an emergency when units are rented out. It’s best EVERY business prepares NOW. When disaster strikes it’ll be our commercial voltage power unit keeping you from ‘going under’. If a neighborhood power grid fails (as they ALL do), you’ll be glad you had the foresight to rent a backup commercial power supply to pull its weight. Having a backup commercial generator on-hand will keep your business from ‘folding and becoming the statistic mentioned above. In mere seconds your generator can automatically start itself when a power outage or low voltage activity is detected. Most modern commercial generators are equipped with sensors to detect when your electrical panel is disrupted. This technology ensures you never experience power loss for prolonged periods of time. It also ensures all of your businesses’ hard wired-systems stay on such as computers, security systems, AC, heat, freezers, and other critical operating equipment. Commercial generators are designed to power larger machines in hospitals, construction sites, restaurants, offices and banking, manufacturing warehouses, government, offices, bank establishments and schools. If, for example, you’re engaged in remodeling work and your main power supply source needs to be shut down for upgrades and/or repairs, our generators ensure your data devices, information storage units and security systems are still engaged to maintain the integrity of your business. Our commercial generating units is a reliable backup power supply to protect your revenue streams by preventing downtime. It’s especially effective for inventory control if you have frozen or heated products or other items relying on climate control. 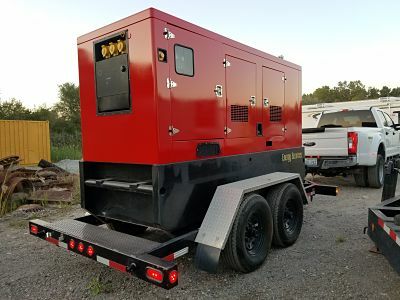 Not having one of our power generators in place during an emergency outage could be the most expensive (and final) mistake costing you thousands of dollars in damages. It could also destroy your brands reputation for reliability and dependability. 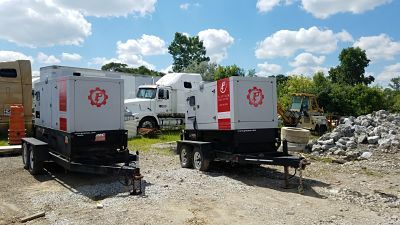 Platinum Generator Rentals and Temp Power has several makes and models for your business to choose from available for rent *depending upon* your needs, budget, purpose, and square space coverage. Contact us today for more information.